I had a great chat with Michiel Rozema from Microsoft NL, who is addicted to PowerPivot like me :). We were talking about joining two fact table and how we could do this, I told him i had a blog post on the roll which you might have seen last week: Combine two files (or fact tables) in PowerPivot using relationships, relationships explained. So i send him the link to this blog post,a few days later he came back to me on this that he had used this technique to do the opposite: he wanted to exclude values from a measure when they were included in a second table. This could also prove very handy and you might be using this often. So today we are going to take a look at using a relationship to exclude measures. 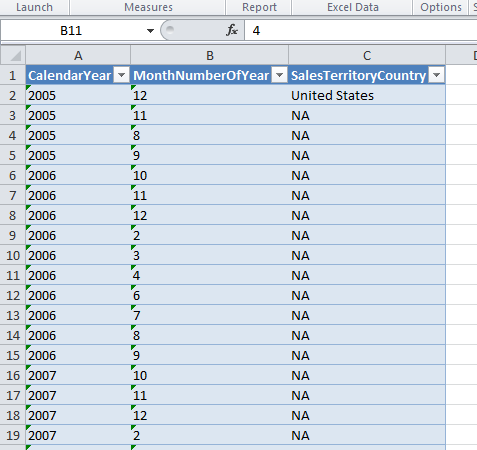 And we create a relationship between them with the exclusion table as lookup table, this table has a unique keyvalue column containing each value once. As you can see you can do great things with DAX making it very easy to implement in all kinds of scenario’s. 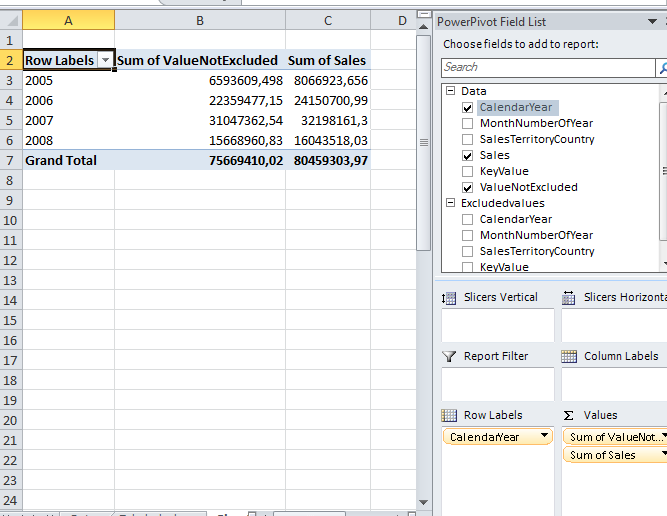 This is another great example of where you can use PowerPivot for! Yesterday I updated to the newest version of PowerPivot (RC0 11.0.1750.32, https://www.microsoft.com/download/en/details.aspx?id=28150). This broke the approach to check for an existing related element. Please file a bug on http://connect.microsoft.com/sqlserver this looks like a product issue to me. I am working on a similar issue, where I am trying to exclude certain days’ sales for certain stores. (e.g. Comp sales calc where a store was closed for construction last year, but is now open during the corresponding days this year. Therefore, this year’s sales should be excluded from the calc.) I actually came up with a solution similar to the one posted here. However, the calculated column used for a relationship in the Sales table (250,000 rows on a 32 bit machine) seems to be very slow (as suggested by Rob Collie in his book). 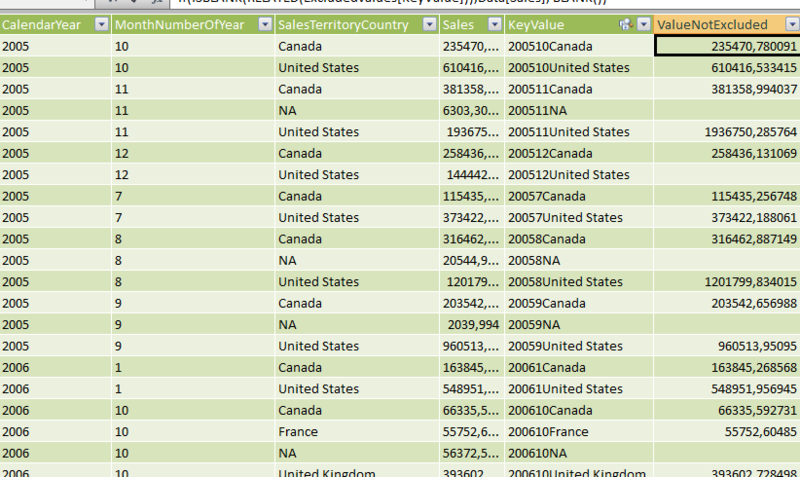 Is there a way I can link my Excluded-Sales table (which includes Store Number and Date to exclude) to my Store/Geography table and Calendar table or I’m assuming this will filter those tables down to just the excluded stores and dates. I’m still new to PowerPivot, so hopefully I’m not overlooking something obvious.